Page.ly is a new product we are developing that allows for quick creation of WordPress based websites, complete with hosting, domain name registration and email service. 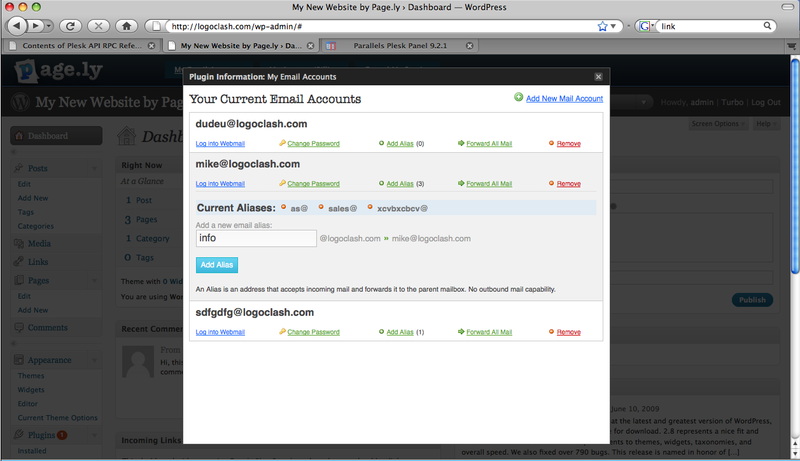 This is screen shot of the WordPress backend of a page.ly site. We created an API that allows the client to administer email services back on the server without having to login to a separate panel. 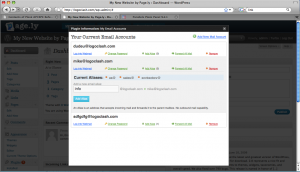 After Authenticating the user is able to create and modify aspects of email accounts such as adding mail alias, setting redirects, and changing mail account passwords. This entry was posted in Oblog, Press, Web of Interest on June 11, 2009 by Joshua Strebel.